Oh that is so funny! Waffles cracks me up. Waffles and Sherpa must be related! And we thought Katie stuffed Waffles in that Coke zero to tell him to lose weight. "He's not heavy Katie, he's Your brother". One of our rescues, Roxie also loves bags. Her mom shows us photos everyday! I think you should host a "cat in bag" contest Waffles and you be the judge! I LOVE the PIN IT button that pops up on the pictures! How in cod's name did he get himself in that box??? That's hilarious!!! 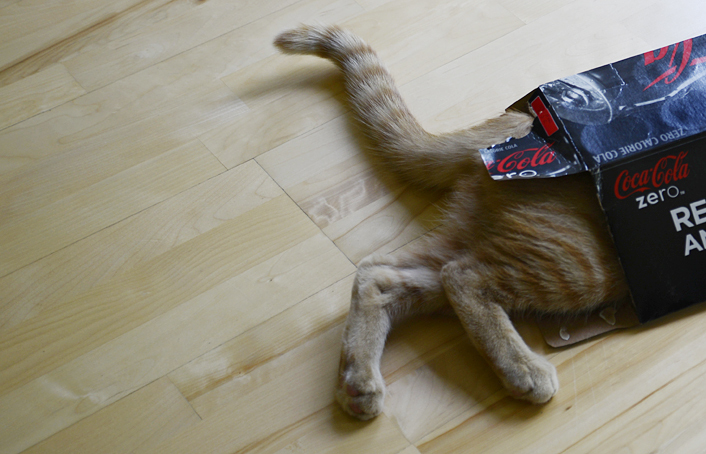 Ha, who knew Coke Zero could be so slimming? Oh that boy reminds me of Odin at the age! Hi Katie, the boy's a nut. Besides my dad says that regular Pepsi tastes way better. Katie, if Waffles did that here, there would be all sorts of attacking and wrassling going on! I think you are missing out on some fun. O i am afraid to say he just keeps getting cuter! We love boxes! You could sit on Waffles-the-box to keep him still?!? Hey Katie suggest you chuck the box in the trash with Waffles in it LOL! You got too much competition. Have a terrific Thursday. Katie, you've got to admit that life is so much more interesting with that little ( OK, he's not so little any more) ray of sunshine Waffles. 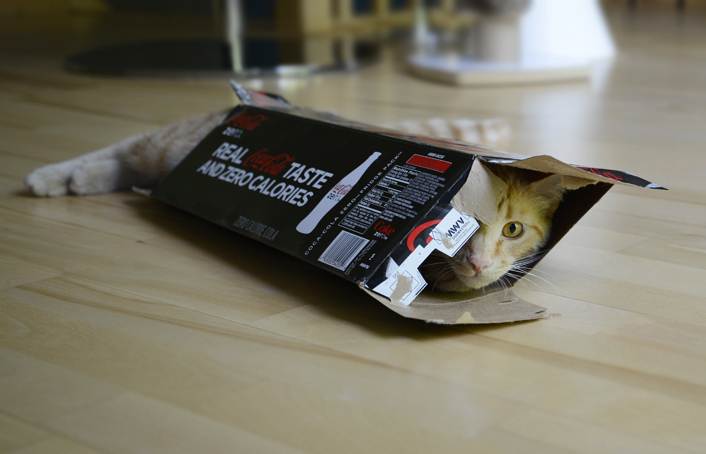 Number 5 - We're concerned that Waffles is now clearly longer than a 12 pack box. Uh... he's only how old ???? LOL! I think Waffles is ready for an upgrade in box size. Hmmm.... I'm not sure about this but... I think... just maybe... I think that just maybe Waffles might be STUCK in that box! Allie: Oh Katie. You're soooo longsuffering! And for the record, of COURSE you're not a dog. Maxwell: you did not ned to tell her that Waffles called her a D-O-G. He didn't mean it that way. I can't believe how Waffles Too has grown. Katie, why didn't you ambush him when he was stuck in that box? Katie, you're a gorgeous, smart ray of sunshine. Katie you don't like boxes. That's not cat like every cat, I've ever owned has loved boxes the smaller the better. Waffles too looks so cute in the box. Maybe you need to just let Waffles too do the box thing and you keep lazing in the blue chair. Maru is a wealthy cat, I believe. Maybe you can put Waffles to some good earning his keep. LOL Waffles you barely fit in there. Katie I think you living with one. You could dare him to squeeze into a really small and tight box...think how fun that would be (for you)! We can't believe you don't like boxes! That is so un-feline like! Here's your chance to get W2--bite his feet and tail! 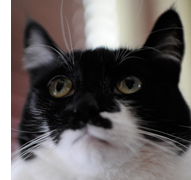 But Waffles is such a good Maru-wannabe! How the #($((# did he get into that box? TW says she lived on Coke Zero at Blogspaw although I've never seen it at home. Did you ever see that blog "Maru can kiss my a$$." It's pretty funny although I stopped reading it cos he doesn't read my blog..
We don'ts know Maru, but we thinks Waffles is pretty funny. Besides if he is a box, he can't bug you Katie, MOL! Well of course you knew that waffles come in boxes!!! er that was 2 words.